innovative products allows us to produce results. Our testing, engineering and manufacturing facilities are housed in a state-of-the-art building. Using our established processes and infrastructure, we have the ability to execute on projects and build value without wasting time or capital. This laser-focused approach avoids inefficiencies and allows us to meet the end-goal: innovate products that meet clinical needs. We start with identifying unmet clinical needs through extensive market diligence and sourcing ideas from our internal team, entrepreneurs, and other collaborations. Product ideas are thoroughly vetted and evaluated through proof-of-concept testing to ensure technical, clinical, and commercial viability. Novel solutions that represent a strategically compelling business opportunity will receive seed funding to support business and clinical needs. 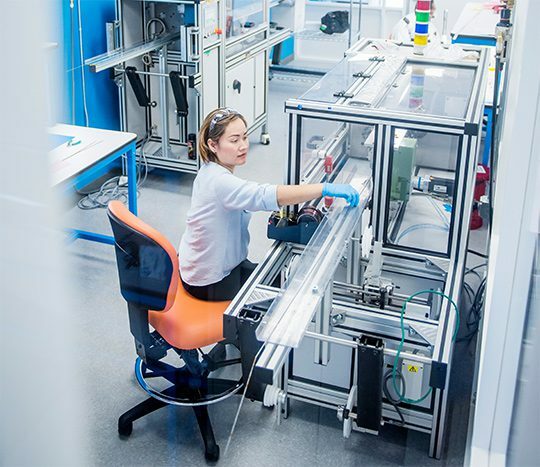 Using our full-scale R&D and manufacturing infrastructure, we can rapidly develop prototypes to further the venture, validate scale and transition from concept to reality. We offer pre-clinical, clinical and regulatory support for validated technologies in preparation for market approval and commercialization. Shifamed’s proven track record has solidified a broad base of investors to help our ventures obtain outside capital. This includes leading venture capital firms, major corporate strategic groups, institutional investors, and angel investors. After securement of funding, the Shifamed team remains fully engaged until the transfer of responsibility is complete. We offer a full range of resources to ensure the new company has the support needed to ensure long-term success.